Fruit & Veggies = Glam! You’ll be surprised how naturally those colorful vegetables add glam to a blend table. Imagine a dinner table with say, a casserole, some bread, and rice or pasta. pretty blend, right? Now add to it a fresh veggie plate (for example, bell peppers, cucumbers, and carrots) plus a roasted vegetable dish (for example, roasted broccoli). Instant color, instant glam. Plus, veggie plates (roasted, pickled or fresh) are an easy and quick addition to any table whether it’s your dinner table, lunch or when you’re hosting an event. Luckily, there are plenty of ways to serve veggies and make your table and plate gorgeous, inviting and delicious! I love serving veggies on large flat platters, it looks festive, elegant, and sophisticated. The large platter also allows room for a dip or soft cheese on the plate. The dip will make you eat more vegetables. Something about the combination of the dip with the crunchiness of the veggies just makes us keep biting. Plus, when you have different vegetables on your veggie plate, each of them is a new flavor when you combine it with the dip and so we keep exploring. By combining different veggies we create a new look and a new flavor. One of the BEST combinations for a fresh veggie plate is: cucumbers, carrots, lettuce, celery sticks, mini colorful peppers and olives. 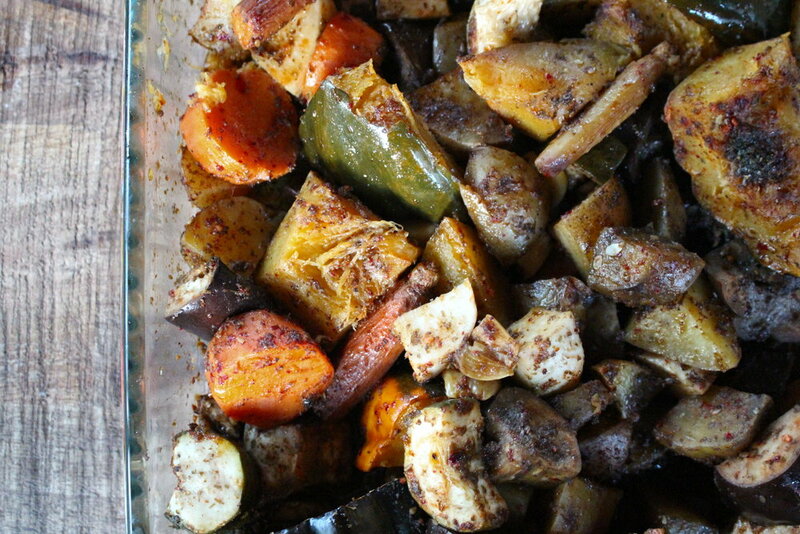 And here’s a great combination of roasted veggies: yams, eggplants, cauliflower, purple onions, garlic, and butternut squash. When creating a plate, mix up the colors. If you have the green veggies, don't put them next to each other, but separate them and put other colors in between such as colorful bell peppers, (yellow, red, green), fennel,and carrots for example. Some people like very few kinds veggies and so they need ways to break the boredom. Different serving options can help with this issue. For example, say your favorite veggie is cauliflower you can switch between whole roasted cauliflower and cauliflower florets. Or say you love Brussels sprouts, you can switch from roasted Brussels sprouts to fresh Brussels sprouts. Plus for fresh veggie plates you can serve whole veggies, sticks, slices, and so on. Roasted veggies are perfect with dressing. 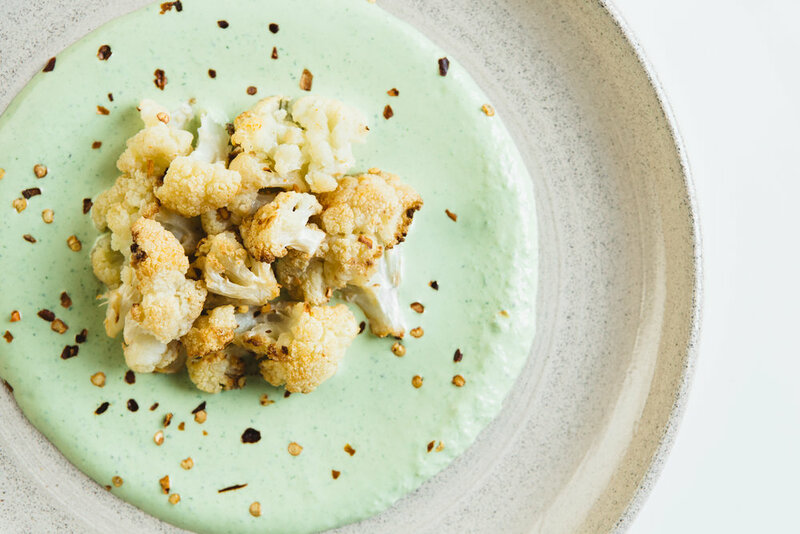 For example roasted broccoli works great with a creamy cashew dressing and roasted cauliflower on a bed of green tahini is absolutely divine (both in looks and in flavor). So easy! Coat the veggies with olive oil then sprinkle them with your favorite spice to add more flavor and to make them look more appealing. You can use: zaatar, paprika, sumac, pepper, cayenne pepper, and so on. Try new veggies. One veggie I'm obsessed with lately, is fresh fennel! It has that crunch that I can't resist, (I LOVE crunchy food!) its low in calories and has that freshness that I LOVE! Other examples are jackfruit, watermelon radish, purple potatoes. There are so many ways to serve vegetables in a way that adds color to your table and interest to your menu. Serve veggies fresh, pickled, roasted, in a salad, as a pattie; really, the sky's the limit. So, mix it up, make it fun and enjoy how gorgeous your healthy table looks!